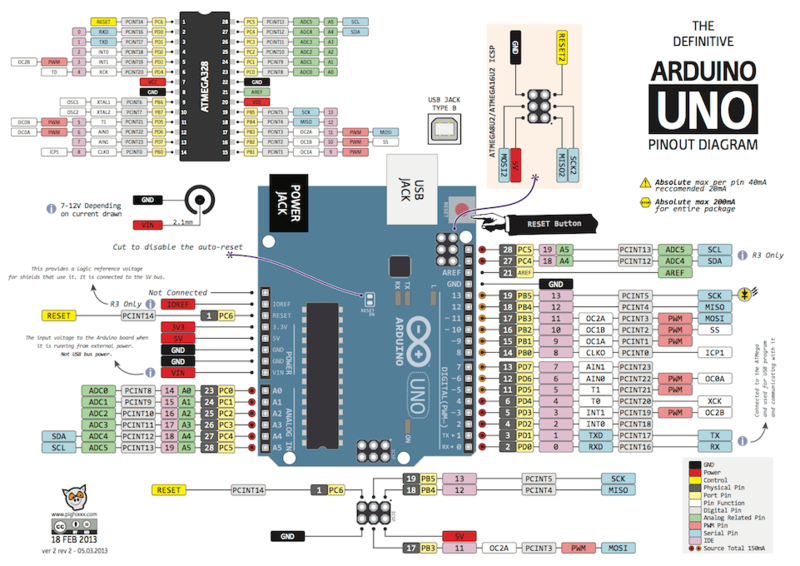 Last year I found some awesome Arduino pinout diagrams with full colour on the Arduino forums. They are all titled something like The Unofficial Arduino Pinout Diagram / The Definitive Arduino Pinout Diagram, etc. They disappeared from the Internet (pighixxx.com) in December 2013. With the help of the Internet Archive’s Wayback Machine I retrieved them. Fortunately they were distributed under a CC-BY-ND license, so here they are again in PDF’s for your download delectation. Here’s an example bitmap version, but I recommend that you download, print and laminate the PDF version for your board. Sorry, I couldn’t find any more PDF’s on the Internet Archive to host here. Bootnote: Reader Nidal Ayari asked me to include a link to his Eagle files for Arduino Pro Mini. I haven’t even looked at them since I Don’t Do Windows (and so my PCB layout tool of choice is KiCad but I assume they’re good ;-).